Change. It’s what drives first-year Global Studies student Zaffia Laplante. 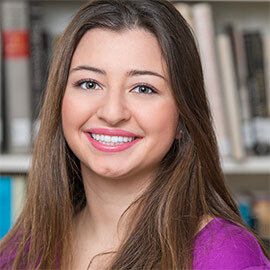 Laplante, a Métis student from North Bay, is determined to change the perception of Indigenous Canadians among her age group, and her Laurier experience is fuelling her mission. Laplante had the opportunity to attend the Indigenous Innovation Summit in Winnipeg last November. The first of its kind in Canada, the summit aimed to connect Indigenous innovators with each other, as well as with innovators outside of the Indigenous community. With funding from various sources, including Laurier’s Social Innovation and Venture Creation (SIVC) unit and the Aboriginal Student Centre, Laplante’s summit experience allowed her to hear Indigenous influencers such as CBC host Wab Kinew and Mohawk Canadian athlete Waneek Horn-Miller present their ideas to infuse Indigenous methodology into mainstream business models, corporate practices and Canadian culture. A spark was ignited in Laplante, and her idea to shift the perception of Indigenous people among fellow first-year university students was born. Laplante’s ideal solution would include a mandatory Indigenous studies course to be taken by all undergraduate students at Laurier, better educating them on the history and culture of Canada’s Indigenous people. "I’ve been asked a lot of questions that reflect negative attitudes about Canada’s Indigenous population," said Laplante. "People seem to stick to their stereotypes." "I can’t believe how many young people don’t know about the residential school system," she added. Laplante feels all Canadians, including youth, should know about the painful parts of this country’s past. Her ideas for such educational policy at Laurier are in the early stages, but will be shared at the Social Innovation Showcase on Jan. 27 at Laurier’s Waterloo campus. Laurier has been making strategic efforts in Aboriginal education, including the creation of the Office of Aboriginal Initiatives in 2010, which designs and implements Indigenous-based programming at the Aboriginal student centres on the Brantford and Waterloo campuses. As part of the university’s Strategic Mandate Agreement with the province, Laurier has identified efforts to increase Aboriginal student enrolment and improve Aboriginal student support as one of its strategic objectives. Laurier’s 2015-2020 Strategic Academic Plan also outlines a commitment to building capacity in Aboriginal education and in the indigenization of its campuses, enabling Aboriginal programming to be expanded under the leadership of Aboriginal students, faculty and staff. Additional information on Indigenous programming and resources at Laurier can be found on the Office of Aboriginal Initiatives website.